Is there more to the Motorola Milestone XT720 than 720p video recording? We've been waiting for the Motorola Milestone XT720 for absolutely ages. When we looked at the Motoroi back in February, we said it was launching in Korea and destined to come to Europe. If your favourite Android handset so far has been the HTC Desire, with its top of the range specs, we really can't blame you. 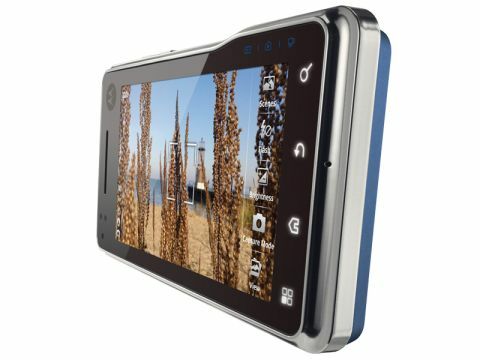 But the Motorola Milestone XT720 could be the handset to give the Desire a run for its money. We say that because of things like its 8-megapixel camera with xenon flash, 720p video recording, HDMI-out – with cable provided – and vast high-resolution screen. Of course there's no Sense UI as you'll find on the Desire, but you might be able to live with that, and the rest of the expected goodies are here too, such as Wi-Fi, GPS and 3G. The Milestone isn't cheap, though. SIM free it'll set you back around £350 (The Desire is currently going for around £390). The Motorola Milestone XT720 is a chunky beast of a phone. It has to be to contain its 3.7-inch screen, but there's quite a lot of framing around the screen so that overall it measures 115.95 x 60.9 x 10.9mm and it isn't light, either at 160g. It feels a bit brickish in the hands, partly because it lacks the rounded edges of the Desire, or indeed the iPhone. And then there's the odd 'hump' on the right hand edge which makes the Motorola Milestone XT720 even wider at the bottom than it is at the top. The upshot is that anyone with smaller hands might struggle to hold the Motorola Milestone XT720 and will almost certainly find it a challenge to reach right across the screen one-handed. This is a handset that is peppered with buttons and connectors. There's nothing on the bottom edge, but on the top you'll find a 3.5mm headset slot and the main on/off/hold button. Oh, and under a hinged cover, that mini-HDMI port for getting video onto your TV. On the left there's a micro-USB port protected by a hinged cover. The right edge houses the volume rocker, camera key and a toggle button which moves you between stills camera, video camera and gallery.